A child who lost members of his family to the Ebola virus plays at the Alliance for International Medical Action (ALIMA) Child Care Centre in Nzérékoré, Guinea. Some nine million children have seen “death and suffering beyond their comprehension,” and protecting them and their communities is critical in the fight against Ebola in West Africa, the UN Children's Fund (UNICEF) said in a report released today. Of the more than 24,000 people infected, some 5,000 are children, while more than 16,000 children have lost one or both parents or their primary caregiver, according to UNICEF. The report also points to the central role communities are playing in the response and shows encouraging trends in safe behaviours. “In Liberia, for example, a survey indicates that 72 per cent of people believe anyone with Ebola symptoms will get better care at a treatment centre, which is significant because many used to keep Ebola victims at home, spreading infection in the community,” according to the agency. The report's release comes days after the UN World Health Organization (WHO) said Liberia reported no new confirmed cases for the second consecutive week from the disease that has affected more than 24,000 people with more than 10,000 deaths. “The outbreak will not be over until there are zero cases, and every single contact has been traced and monitored. We cannot afford to let our guard down,” Barbara Bentein, UNICEF's Global Emergency Coordinator for Ebola, said in a press release. “At the same time, basic services need to be re-established safely and responsibly, using the assets of the response,” she added. UNICEF, which helped minimize the risk of Ebola infections when schools reopened following months of closures that left 5 million children out of school, noted that investing in improving health care systems in Ebola-affected countries will help tackle other diseases such as measles, pneumonia and diarrhoea, which take a heavy toll on children. 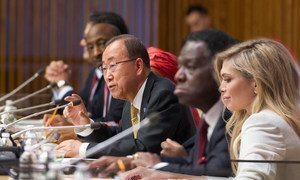 At a high-level event this morning at the United Nations, Secretary-General Ban Ki-moon said preventable deaths of women and children could be ended “within a generation,” with political commitment an increase in innovative financing and strong partnership.